So I have been writing and re-writing this post. It has taken the form of talking about my New Year’s Resolution, or about attending the Women’s March in DC, or about the family photos, but the actual point of the post always came back to the same thing. I’m going to stop writing at the blog. Effective today all my blog posts have been made private, assuming I’m reading the fine print at wordpress that means no one else can see them. So this is something I’ve been working up to for the last couple of years. There’s been a huge shift in my life, mostly surrounding my level of talking about adoption. For a long time, the times I talked about adoption were here, with my son’s family, and with friends and co-workers who were around during the pregnancy and knew all about J. That was true for the first couple of years, and then shift started to happen. I talked about J more in real life than on the blog. I had more support from actual in person other biological parents and needed it less through my computer. I started doing panels, interviews, writing articles. Then I outside of the adoption community, to friends and family who I had been left out of my life in adoption I found ways to include them. And suddenly it stopped being only myself who was telling the story, but they started telling their own. Sharing their part with others. And talking about my son’s adoption was out of my hands, I no longer had full control of the narrative. 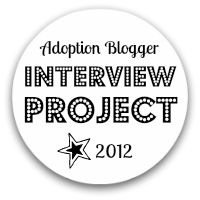 This blog was my way of finding support among people who knew adoption. I hope along the way I helped give some support and guidance as well. I hope that my perspective helped to deepen some of your perspectives. But that wasn’t why I wrote. I wrote because I needed this, a place where I could work through things, where I could figure out how I felt. It was the tool I needed to get through what I was going through. I don’t need this blog like I used to. I don’t need the support system I built here. But more importantly there is a huge need in my life this blog isn’t filling. I need to find a way to be at the front of conversations about my son with people in my life. When someone has a question about what it was like for me, or how I deal with another Mother’s Day or birthday, I need for them to come to me. I need a place to tell my story to the people involved in my life. And I can’t wrap my head around a way to open this blog up widely, so instead I will start over. From now on I will only write about adoption under my name. I will write in a place that is linked to other parts of my life. I will hopefully be able to continue to write about it honestly and give it the same thought and insight I have always tried to maintain but it will be about sharing my knowledge and experiences with those in my circle so they understand more. Before I go first I want to say thank you. To every person that has read here. Especially that period of time where I needed you to read, where I needed to feel heard. It made a difference to me and helped me create a new baseline for myself. I have 730 posts, each a part of my story and a piece of myself. Sharing that much of who you are into the void can be hard. I know people who were torn down and treated terribly in the void of the internet. More often than not I wasn’t. I was treated with respect and tenderness by all of you. Even those who challenged me almost always did it with respect. So thank you. I have been on the other end of this – seen people who I followed and who I felt connected to disappear on me, their story unfinished. So I am going to offer this – if you are interested in continuing to follow my life and hear about what I’m doing email me. Tell me who you are and your connection to adoption. Tell me how long you read and how you found me (or don’t, but it would be nice to know who is following along). If you write me, I’ll let you know ways to stay up to date with my story and places where I’m sharing it. If you want access to a specific post, let me know that. I may be able to help you out. Thank you for following along, and in one final gift (for reading here and for reading this post) here’s a picture of J. From our family photos this year. He’s 6.5 years old.